Outbrain has been an early adopter of Hadoop and we, the team operating it, have acquired a lot of experience running it in production in terms of data ingestion, processing, monitoring, upgrading etc. This also means that we have a significant ecosystem around each cluster, with both open source and in-house systems. A while back we decided to upgrade both the hardware and software versions of our Hadoop clusters. “Why is that a big problem?” you might ask, so let me explain a bit about our current Hadoop architecture. We have two clusters of 300 machines in two different data centers, production and DR. Each cluster has a total dataset size of 1.5 PB with 5TB of compressed data loaded into it each day. There are ~10,000 job executions daily of about 1200 job definitions that were written by dozens of developers, data scientists and various other stakeholders within the company, spread across multiple teams around the globe. These jobs do everything from moving data into Hadoop (for ex. 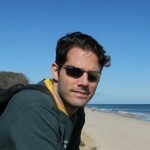 Sqoop or Mysql to Hive data loads), processing in Hadoop (for ex. running Hive, Scalding or Pig jobs), and pushing the results into external data stores (for ex. Vertica, Cassandra, Mysql etc.). An additional dimension of complexity originates from the dynamic nature of the system since developers, data scientists and researchers are pushing dozens of changes to how flows behave in production on a daily basis. This system needed to be migrated to run on new hardware, using new versions of multiple components of the Hadoop ecosystem, without impacting production processes and active users. A partial list of the components and technologies that are currently being used and should be taken into consideration is HDFS, Map-Reduce, Hive, Pig, Scalding, and Sqoop. On top of that, of course, we have several more in-house services for data delivery, monitoring and retention that we have developed. I’m sure you’ll agree that this is quite an elephant. In place: In place migration of the existing cluster to the new version and then rolling the hardware upgrade by gradually pushing new machines into the cluster and removing the old machines. This is the simplest approach and you should probably have a very good reason to choose a different path if you can afford the risk. However, since upgrading the system in place would expose clients to a huge change in an uncontrolled manner and is not by any means an easily reversible process we had to forego this option. Flipping the switch: The second option is to create a new cluster on new hardware, sync the required data, stop processing on the old cluster and move it to the new one. The problem here is that we still couldn’t manage the risk, because we would be stopping all processing and moving it to the new cluster. We wouldn’t know if the new cluster can handle the load or if each flow’s code is compatible with the new component’s version. As a matter of fact, there are a lot of unknowns that made it clear we had to split the problem into smaller pieces. The difficulty with splitting in this approach is that once you move a subset of the processing from the old cluster to the new, these results will no longer be accessible on the old cluster. This means that we would have had to migrate all dependencies of that initial subset. Since we have 1200 flow definitions with marvelous and beautiful interconnections between them, the task of splitting them would not have been practical and very quickly we found that we would have to migrate all flows together. Side by side execution: The 3rd option is to start processing on the new cluster without stopping the old cluster. This is a sort of an active-active approach, because both Hadoop clusters, new and old, will contain the processing results. This would allow us to migrate parts of the workload without risking interfering with any working pipeline in the old cluster. Sounds good, right. 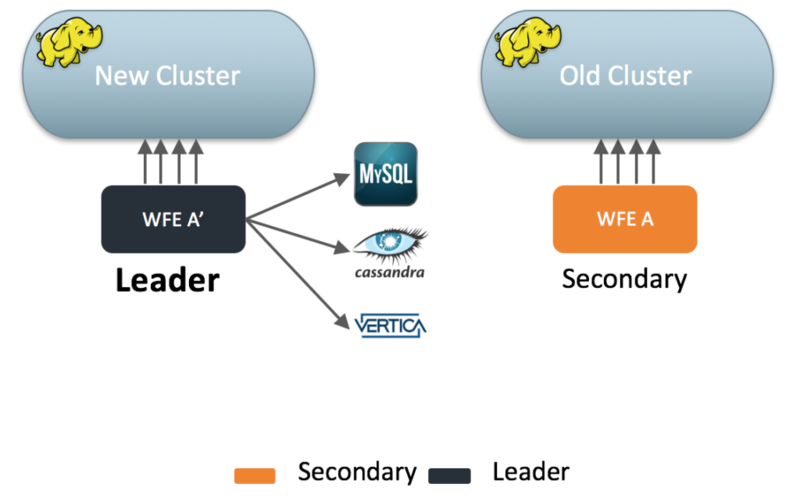 We have a framework that allows applications to push raw event data into multiple Hadoop clusters. For the sake of simplicity, the diagram describes only one cluster. 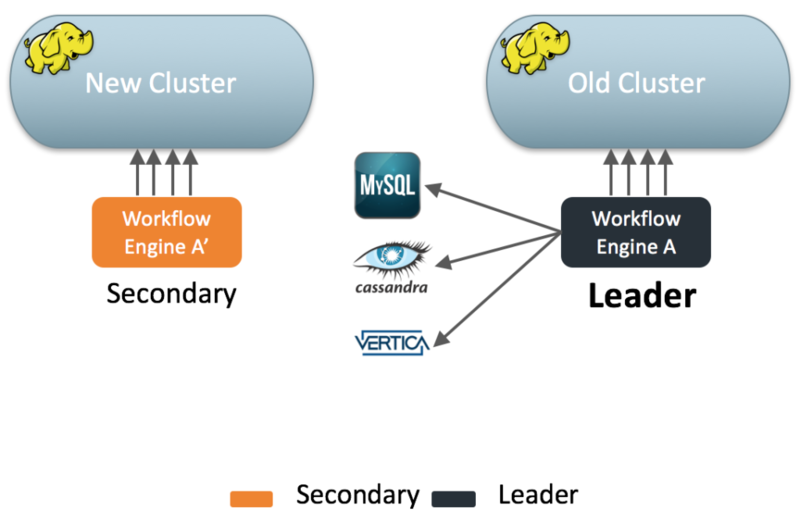 Once the data reaches Hadoop, processing begins to take place using a framework for orchestrating data flows we’ve developed in-house that we like to call the Workflow Engine. Each Workflow Engine belongs to a different business group. That Workflow Engine is responsible for triggering and orchestrating the execution of all flows developed and owned by that group. Each job execution can trigger more jobs on its current Workflow Engine or trigger jobs in other business groups’ Workflow Engines. We use this partitioning mainly for management and scale reasons but during the planning of the migration, it provided us with a natural way to partition the workload, since there are very few dependencies between groups vs within each group. Now that you have a better understanding of the existing layout you can see that the first step is to install a new Hadoop cluster with all required components of its ecosystem and begin pushing data into it. Let’s think a bit about what options we had for running a side by side processing architecture. We could use the same set of Workflow Engines to execute their jobs on both clusters, active and new. While this method would have the upside of saving machines and lower operational costs it would potentially double the load on each machine since jobs are assigned to machines in a static manner. This is due to the fact that each Workflow Engine is assigned a business group and all jobs that belong to this group are executed from it. To isolate the current production jobs execution from the ones for the new cluster we decided to allocate independent machines for the new cluster. Now that we have a fully operational Hadoop cluster running alongside our production cluster, and we now have raw data delivered into it, you might be tempted to say: “Great! Bring up a set of Workflow Engines and let’s start side by side processing!”. Since there are so many jobs and they doing varied types of operations we can’t really assume that letting them run side by side is a good idea. For instance, if a job calculates some results and then pushes them to MySql, these results will be pushed twice. Aside from doubling the load on the databases for no good reason, it may cause in some cases corruption or inconsistencies of the data due to race conditions. In essence, every job that writes to an external datasource should be allowed to run only once. Leader: Run all the jobs! Secondary: Run all jobs except those that might have a side effect external to that Hadoop cluster (e.g. write to external database or trigger an applicative service). This will be done automatically by the framework thus preventing any effort from the development teams. When a Workflow Engine is in secondary mode, jobs executed from it can read from any source, but write only to a specific Hadoop cluster. That way they are essentially filling it up and syncing (to a degree) with the other cluster. Notice that I’ve only included a Workflow Engine for one group in the diagram for simplicity but it will look similar for all other groups. So the idea is to bring up a new Workflow Engine and give it the role of a migration secondary. This way it will run all jobs except for those writing to external data stores, thus eliminating all side effects external to the new Hadoop cluster. Safely upgrade each business group’s Workflow Engine separately without impacting other groups. Since the new cluster is running on new hardware and with a new version of Hadoop ecosystem, this is a huge milestone towards validating our new architecture. The fact the we managed to do so without risking any downtime that could have resulted from failing processing flows, wrong cluster configurations or any other potential issue was key in achieving our migration goals. In this phase all jobs will begin running from the new Workflow Engine impacting all production systems, while the old Workflow Engine will only run jobs that create data to the old cluster. This method actually offers a fairly easy way to rollback to the old cluster in case of any serious failure (even after a few days or weeks) since all intermediate data will continue to be available on the old cluster. The overall process is to push all Workflow Engines to phase 1 and then test and stabilize the system. We were able to run 70% (!) of our jobs in this phase. That’s 70% of our code, 70% of our integrations and APIs and at least 70% of the problems you would experience in a real live move. We were able to fix issues, analyze system performance and validate results. Only once everything seems to be working properly we can start pushing the groups to phase 2 one by one into a tested, stable new cluster. Once again we benefit from the incremental nature of the process. Each business group can be pushed into phase 2 independently of other groups thus reducing risk and increasing our ability to debug and analyze issues. Additionally, each business group can start leveraging the new cluster’s capabilities (e.g. features from newer version, or improved performance) immediately after they have moved to phase 2 and not after we have migrated every one of the ~1200 jobs to run on the new cluster. One pain point that can’t be ignored is that inter-group dependencies can make this a significantly more complicated feat as you need to bring into consideration the state of multiple groups when migrating. Incremental Migration – Due to the fact that we had an active-active migration that we could apply on each business group, we benefited in terms of mitigating risk and gaining value from the new system gradually. Reversible process- since we kept all old workflow engines (that executed their jobs on the old Hadoop cluster) in a state of secondary execution mode, all intermediate data was still being processed and was available in case we needed to revert groups independently from each other. Minimal impact on users – Since we defined an automated transition of jobs between secondary and leader modes users, didn’t need to duplicate any of their jobs. We have completed the upgrade and migration of our main cluster and have already started the migration of our DR cluster. There are a lot more details and concerns to bring into account when migrating a production system at this scale. However, the basic abstractions we’ve introduced here, and the capabilities we’ve infused our systems with have equipped us with the tools to migrate elephants. For more information about this project, you can check out the video from Strata 2017 London where I discussed it in more detail.